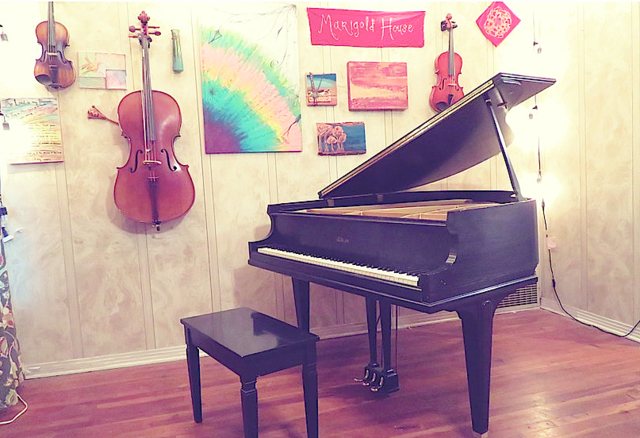 A Modern-Day Wolfgang Amadeus Mozart in Garland, Texas? Here in Garland, Texas we have opportunities to listen to all kinds of live music—from country and blue grass to classical. Last night Charlie and I joined the lucky ones who had the opportunity to listen to Bobby Orozco play his grand piano in the living room of the Orozco’s home (also known as “The Marigold House”) on 1414 Resistol here in Garland, Texas. Before leaving we joined others in audiences who before us signed a door in the Marigold House. I feel overwhelmingly lucky to have been able to spend time listening to this great musician and composer perform live in such a small intimate setting. Tonight there were 15 in the audience—young, old and in between. 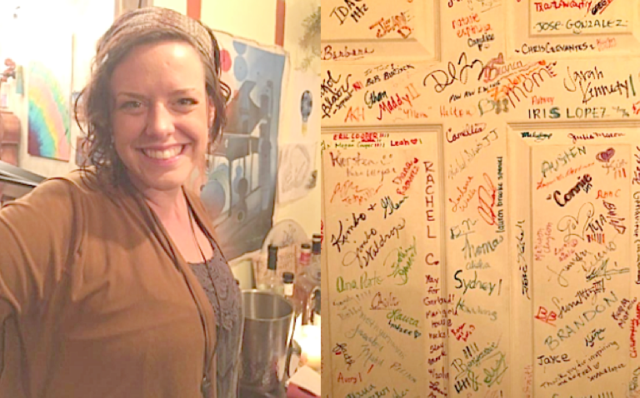 Jessica Orozco and door in their home that has been autographed by audiences who have attended concerts at the Marigold House. Jessica, Bobby’s wife, is a Spanish teacher who has studied in Spain, painter and gracious hostess. Her work decorates the walls of the two rooms that are open to the public when they have house concerts. The audiences who attend these intimate concerts also have a small part to play in decorating the Marigold House since they are asked to sign a door in the Orozco home before leaving. Although you can’t see it in the photo above, Charlie and I both signed our names before leaving. The audiences also get to add touches of spray paint to a piano that sits in their front yard. Charlie and I sprayed some paint on the Orozco's yard art piano before we left for home. 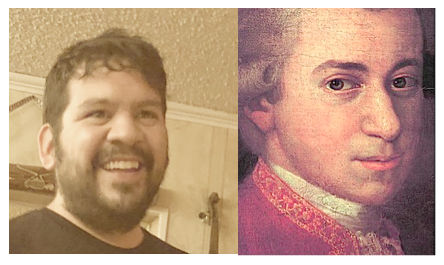 Bobby Orozco, a Garland Texas resident, may not be Wolfgang Amadeus Mozart, but he is likely the one pianist/composer closest to Mozart’s talent living today in the DFW area. The parallels between the two musicians are very apparent in Orozco’s style and compositions and approach to music. Like Mozart, Bobby has a gift for absorbing and adapting features of others’ music into his own compositions. For one example, as a child Mozart met and listened to the music of J. C. Bach. Mozart adapted many features from Bach’s baroque style to his own compositions. There were many other musicians whose features Mozart absorbed as well. In this piece the right hand (reserved primarily for treble clef) played in a major key while the left hand played in a minor key at the other end of the piano. Bobby told us the piece was inspired during a camping trip taken when the heat index was off the charts. They were surrounded by a field of sunflowers and noticed how the flowers turned to face the sun. When they went to sleep at night the sunflowers faced west. When they awoke in the morning the sunflowers faced east. I love knowing where and/or under what circumstance a composer made their compositions as this knowledge adds another depth to my understanding of the sounds of their creation. This knowledge provides a context, a backdrop for enhancing a fuller appreciation of the music and helps to bring the audience a little closer to the experience of the artist. The piece is beautiful and Bobby played it from his soul with precision. For me, the music made with his right hand evoked visions of the delicate gentle organic movements of the sunflowers following the sun across the sky. The left hand created sounds reminiscent of the feelings of the heavy oppressive heat of a Texas summer—creating strikingly different yet harmonious sounds blending together in a feeling delivered on the wings of music instead of words. Naturally, with my love of the garden, it’s no surprise that this particular piece with its deep organic connections was my favorite. The next time I see Bobby I might suggest that he walk around the Garland Community Garden (Naaman School Road and Brand) and see if a new composition might be inspired in our garden setting that so many have described as magical and healing. Thank you Bobby and Jessica for a great evening. Bobby has a degree in music from Lamar University in Beaumont, Texas where he studied under the tutelage of Dr. Richard Dowling, a Steinway Artist, who specializes in chamber and jazz/ragtime piano works. Bobby graduated in 2011 with a degree in piano. Thus, one of his avenues for income is substitute teaching. Currently some lucky students in Rowlett have him for a while. In addition to substitute teaching, Bobby plays gigs for various types of business openings and events. Then there are his house concerts such as the one last night, which brings in a whooping $7 a head, the current price of tickets to the Marigold House. Also through his company, Sailing West Music, Bobby composes and plays music for weddings and other special events. And finally he sells beautiful cotton T-shirts that feature silk-screened music sheets with his compositions. Bobby Orozco is definitely a musician worth supporting.